Max Crook is a legend of rock and roll, a pioneer who blazed a trail that allowed electronics to be incorporated into rock. He developed an instrument called the Musitron, several years before the first commercially available synthesizers were manufactured. 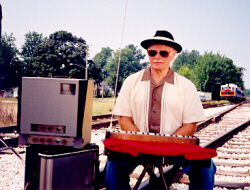 He immortalized the sound of his invention on the unforgettable classic "Runaway" by Del Shannon, providing a keyboard solo that would echo throughout history and provide spine tingling shivers for generations of rock fans. He would work extensively with Shannon, as well as with other famous musical figures, including Liberace. 1. When did your interest in music begin? How old were you when you started dabbling with music? My interest in music began at the age of approximately 12. I was first interested in the accordian, but eventually moved to the piano. 2. You've obviously always had a keen interest in technology, and how it can be applied in music. Nowadays technology plays such an integral role in music, and many musicians can now record entire works in the comfort of their home studios. What do you think of this? My interest in tech-music was originally to find new sounds and to emulate the sounds of other instruments from the keyboard. Technology has progressed to the point that enables even non-musicians to construct complicated musical scores on computers. I have, and always will actually compose and play the actual notes as a musician would do. 3. You've worked with so many legendary musicians over the years. Was there one in particular who really left a huge impression on you? The musician who left the greatest impression me (beside Del Shannon) was Liberace. 4. How did you start collaborating with Del Shannon? How did the both of you meet? 5. What inspired you to create the Musitron? Were you trying to create a keyboard that was an improvement over the keyboards that were available at the time? I was seeking new and different sounds. There were no exotic keyboards around at that point (1958) so I sought out something I could "tweak" with, customize, and combine with various effects which I built because none were available at that time. 6. How was the infamous solo on "Runaway" created? Did it take a long time to come up with it, or did it happen fairly quickly? The solo was created "on the job" at a night club during the initial writing of the Runaway song. The solo evolved very quickly (see website). 7. I'm assuming that the first time you heard the Clavioline you must have been very intrigued. How did you first discover this instrument? which lent itself to electronic and mechanical changes. 8. Synthesizers really gained popularity in the late 60s and into the 70s. Was there a particular keyboard at that time that you were especially fond of? The Moog synthesizer was available in limited quantity in the late 60's and even though primarily a monophonic instrument, it combined the latest analog technology with music philosophy, which was alluring to me. 9. You've obviously done a lot of work over the years with analog technology. How do you think analog compares to the more recent digital technology? Digital technology far surpassed analog, but analog still has the "warmer" life-like sound. Analog is easier and quicker for me to record with (a whole story in itself). For a "techie" or non musician digital is the only way to go (that is not to say musicians don't use digital). 10. What are you up to these days? What current musical projects are you working on? evangelistic and Praise and Worship. 11. What interests or hobbies do you have outside of music? My wife and I travel in our motorhome. 12. What are your plans for the future? Future plans include developing more Christian music, particularly for church Praise and Worship. 13. Do you have any advice for any up and coming artists who would like to be successful with their music? My advice for up and coming musicians is to consider your instrument(s) important enough to set aside specific time periods for practice each day, stick to the schedule, and seek knowledge from those who are successful in your field. The best way to Carnegie Hall is practice, practice, practice!!! !